I was really excited to read this book because Andrea and Raphael are some of my favorite secondary characters in a series. This book is told in the same time period as Magic Gifts, which was told from Kate's point of view. I had a hard time warming up to Andrea as a heroine, and I'm not sure why. I think a part of it was because I was so used to everything being from Kate's point of view. I think another reason was that there was a lot of action in the first part of the book, but not a lot of interaction with other characters if that makes since. I did love how she took Ascanio (sp) under her wing, and played peace keeper between him and Julie. I did love how Andrea came into her own in the second half of the book, but I had trouble with some events that just seemed to happen a little too easily after a lot of buildup. While I had a little trouble with Andrea as a heroine, I had no trouble with Raphael. Raphael quickly won me over as an Alpha hero. He was great. He really understood Andrea, where she was coming from but didn't cut her any slack. My favorite part of the book was when he wrote Mine on Andrea's table. 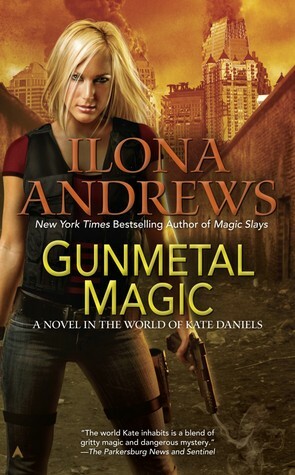 I think I would have enjoyed this book more if I hadn't read Magic Gifts a few days prior, because the first half of the book just felt like a repeat of that novella, even though events were a bit different. However, I loved the second half of that book and I think it's because there was more of Raphael in it. :) For a spin off book though, this was an enjoyable read and I really hope that there are more books with Raphael and Andrea in them.